Bomanite Licensee, Texas Bomanite has worked with Hope Fellowship Church in Frisco, Texas for several years in different construction phases throughout the main areas of the building. Mycon General Contractors brought in Texas Bomanite for several architectural concrete applications that needed updating at the Frisco campus. Working with Small Architects, and Mycon, Texas Bomanite installed Bomanite polished colored concrete for the floors of the lobbies, stairs, hallways, auditorium and sanctuaries and upgraded the church parking lot to a pervious Grasscrete stone filled system to accommodate the need for pervious requirements and stormwater management. Hope Fellowship is a 3-campus Bible Church located in Frisco (East campus and West campus) and in McKinney, Texas with services in Prosper, TX. The Church broke ground with the Frisco East campus in April 2017 and completed the expansion late 2018 that included renovating all of the children’s areas, adding a 1,700-seat auditorium and adding more ministries, such as Hope Students, Adventure Kidz, a recovery ministry and a marriage ministry. The concrete finishes that were installed included 31,890 square feet of Class B exposure with Level 3 gloss Bomanite Patène Teres polished concrete flooring throughout the campus interior, along with 4,850 square feet of Patène Artectura dyed and sealed concrete and 2,820 lineal feet of joints filled with polyurea joint filler. Two custom brown dye colors were selected by the architect to create a warm, earthy and inviting feel. The main challenge in this project was working around the schedule of the parishioners and staff who utilize both the inside and outside of the building for classes, church services, and gatherings. The church asked that the work be completed with minimal daytime disruption. This required Texas Bomanite to work overnight on numerous occasions to remain on schedule. A crew of 5 worked through the evenings to complete the Bomanite Patène Teres polished concrete system on time. In addition to the interior floors, the church was required to decrease the sites overall impervious percentage and to allow for stormwater drainage. 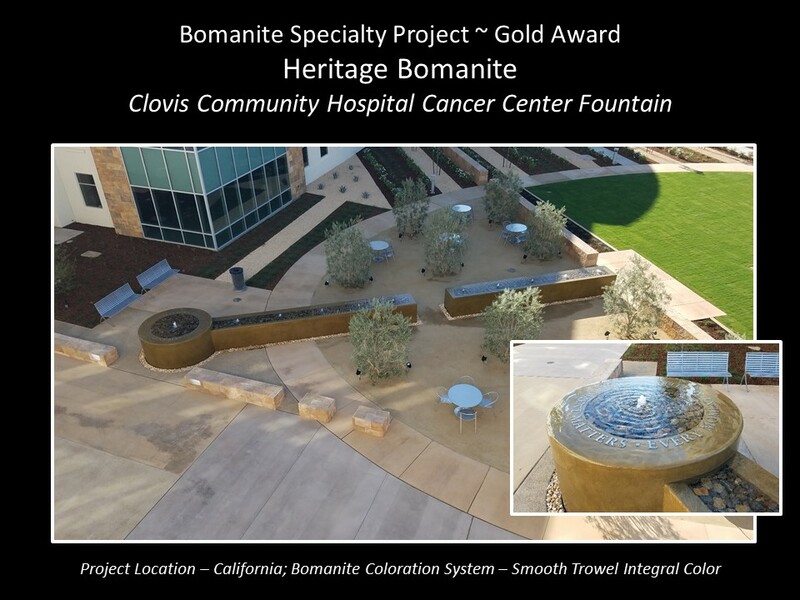 By having Texas Bomanite install 1,800 square feet of Bomanite Grasscrete pervious concrete using the biodegradable Molded Pulp Former and filling the voids with crushed stone the criteria and requirements were met. 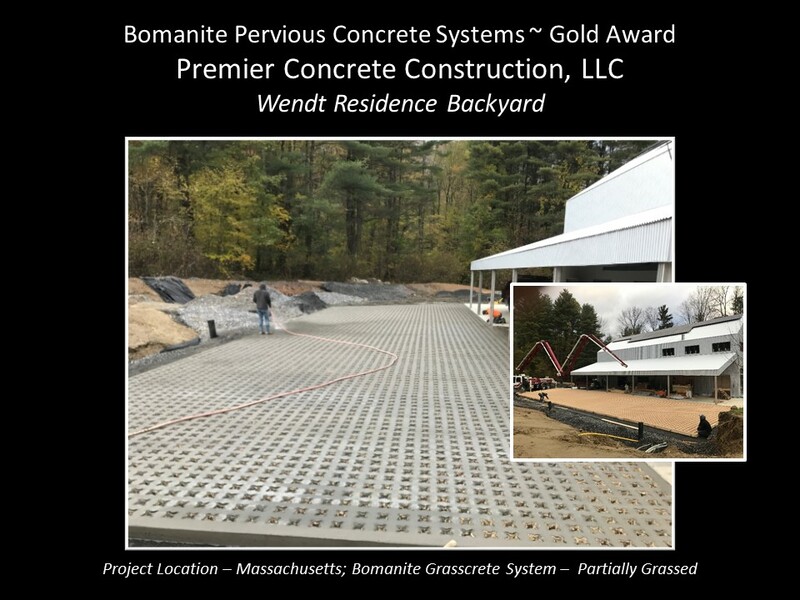 http://bomanite.com/system_sub/patene-teres/, http://bomanite.com/system_parent/pervious-concrete-systems/, http://www.texasbomanite.com/product/polished, http://www.texasbomanite.com/product/grasscrete, hopefellowship.net and mycon.com. Infinite Campus is the largest U.S. owned K-12 student information management firm that is nestled among natural wetlands and a city park. Wanting to allow views to the exterior natural elements, the Finn Daniels Architect firm made sure the design incorporated architectural precast concrete wall panels, a glass curtain wall, and metal panels to provide views as well as creating an energy efficient building. The interior features open work spaces, two story garden elements with crossing bridges, a central rotunda, training rooms, and a full food service cafeteria. When planning the cafeteria, the owner, Infinite Campus and Finn Daniels Architects wanted a free-flowing design that would complement existing epoxy terrazzo floors and carpet. The area needed to work with the natural elements already set and required low maintenance with a reflective sheen. During the conceptual stage the design team determined that the decorative concrete indoor flooring project should emulate the feeling of a sandy beach or shoreline which would shimmer and glisten like shells and sea glass in the sun. 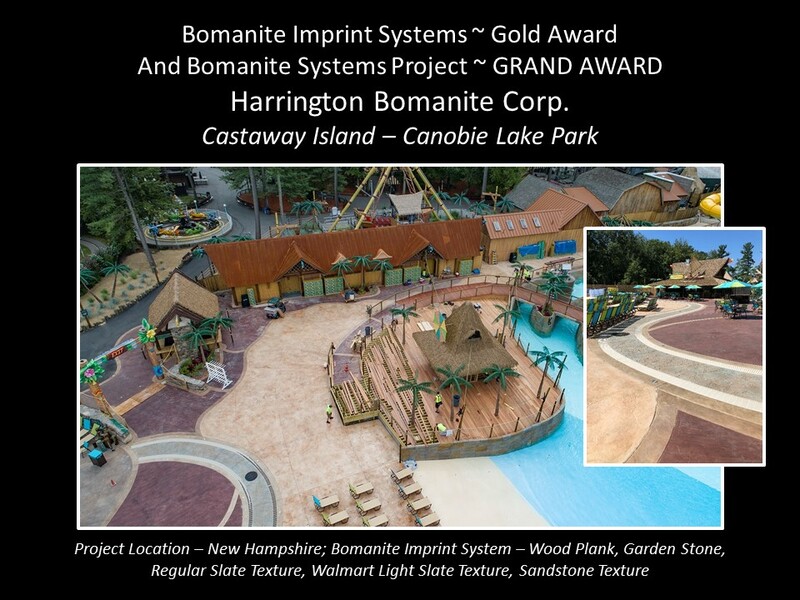 Bomanite Licensee Concrete Arts, Inc. provided the natural beach look by installing the Bomanite Custom Polishing Systems with Bomanite Modena Monolithic for the winding middle sea shell area and Bomanite Renaissance Deep Grind for the shoreline perimeter. The two unique appearances were accomplished by first pouring the two perimeter pours of Bomanite Renaissance utilizing integral color to achieve the desired shade of concrete. Then the Bomanite Modena Monolithic portion was poured to complete the winding area in between. The soft gray color of the Bomanite Modena Monolithic was enhanced with black and blue natural aggregates blended with blue recycled glass. Mirrored glass, sea shells and mother of pearl were also hand-seeded to create the shimmer and iridescence reminiscent of that perfect beach feel. 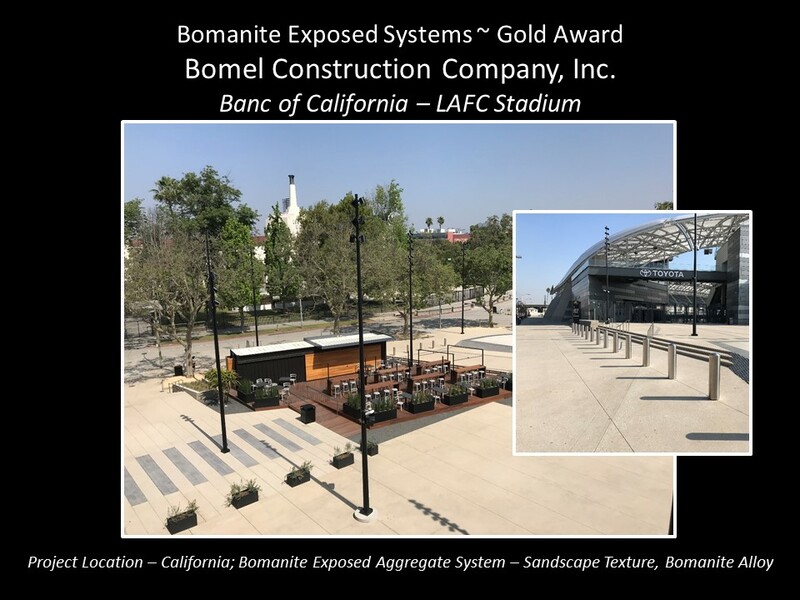 Bomanite Modena Monolithic is a poured-in-place monolithically bonded concrete overlay utilizing integral colorants blended with engineered cements and aggregates. 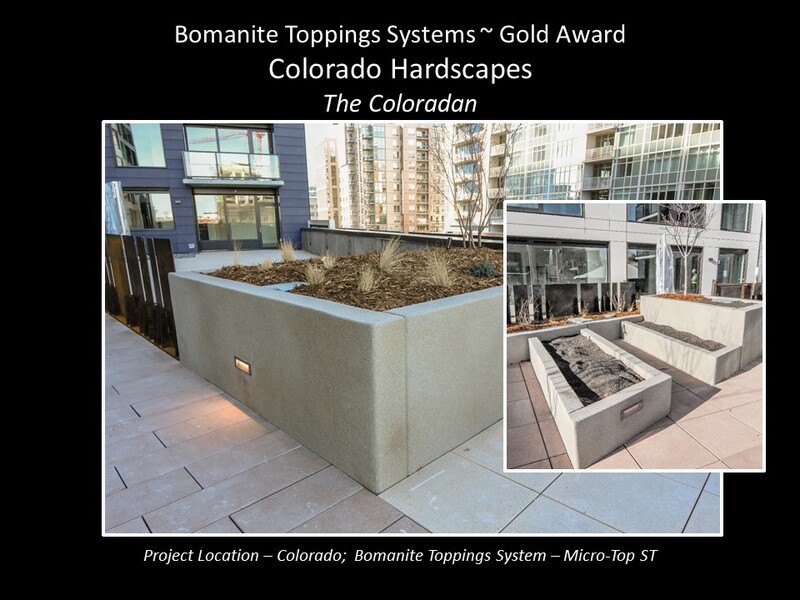 Bomanite Renaissance Deep Grind is a poured-in-place colored concrete slab with selected aggregates ready-mixed and finished to receive a deep grind and polish. Once both areas were placed and sufficiently hardened, Concrete Arts began the grinding and polishing process. This exposed the beauty of the glass and aggregate while providing a low maintenance, durable surface with great sheen and light reflectivity. When the sun shines through the glass curtain wall on the new cafeteria floor it evokes that happy feeling like a day at the beach.